← In Memoriam: How did Houdini die? 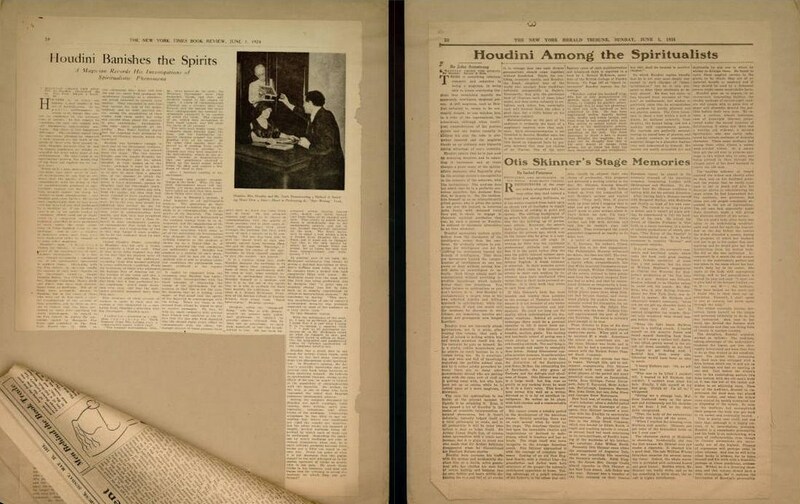 The Harry Ransom Center at the University of Texas at Austin has launched a new website featuring several free digital collections, including two that will interest Houdini buffs, magic fans, historians, and researchers: The Harry Houdini Scrapbook Collection and the Magic Posters and Playbills Collection. Prior to this launch, both of these outstanding collections were available only through the Victorian Popular Culture Portal for a fee (or free if you happened to be a student or faculty member at a university that subscribed to the Portal). I’ve included brief descriptions of both of these collections below, with direct links to each subcategory or individual image so you can quickly dig in to the material yourself using the Ransom Center’s online viewer, which includes useful tools such as zoom in/zoom out, full-screen view options, page rotation, and “Page Flip View” to view images as if you’re turning the pages of a scrapbook or photo album. There is a combined total of 1,180 images in both collections, and individual images are downloadable (small sizes only). Keep in mind that these digital collections do not represent all the material housed in the Ransom Center. Researchers are welcome to visit Austin to peruse the stacks and even take pictures in the reading room at no charge (for personal use only). To obtain a more detailed working inventory of either collection (in Word format), contact the Center’s Performing Arts staff or email me a request and I’ll forward the documents to you. This entry was posted in Collections, Digital, Harry Houdini and tagged collections, ephemera, harry houdini, harry ransom center, houdini, magic, magicians, playbills, posters, ransom center, ut austin. Bookmark the permalink.